I’ve read Sandra Brown off and on over the years. I hate to admit there had been quite a dry spell until I stumbled across her book, Lethal. I loved that book and it started a new love affair with Sandra’s books. Since reading Lethal I’ve tried to get my hand on every Sandra book I could. Her latest book, Friction released in August 2015 and is quite the page-turner. Here’s my 4* review – Texas Ranger, Crawford Hunt wants his daughter back. Following the death of his wife four years ago he fell into a downward spiral that left his five-year-old daughter Georgia in the custody of her grandparents. But Crawford has cleaned up his act and now the fate of his family lies with Judge Holly Spencer. Despite Crawford’s obvious love for his child and his commitment to being an ideal parent, Holly is wary of his checkered past. Her opinion of him is radically changed when a masked gunman barges into the courtroom during the custody hearing. Crawford reacts instinctually, saving Holly from a bullet. But authorities apprehend the wrong man, and the real gunman remains unknown, at large, and a threat. Friction is a fast paced, action packed, page-turner. It kept me on the edge of my seat and my stomach churning … everything a good thriller should do. The story is well written and the characters believable. But there wasn’t the huge twist at the end that I’ve come to expect of Sandra Brown. It becomes pretty obvious who the killer is and I kept waiting to be proven wrong, for the story to take a huge turn and really shock me. I wasn’t wrong and the reason behind the killer’s actions just seemed meh. As I read, I was thinking really? You did this because of that?! This one aspect of the storyline is my one dislike of the book. 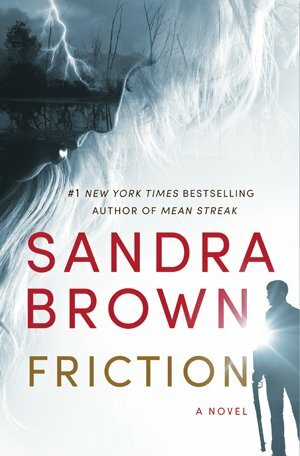 Fans of Brown and the genre won’t be disappointed in Friction. Looking for a little romance too? You won’t be disappointed either. I predict Friction will be another winner! Sandra, it’s been a pleasure! THANKS for joining us!